In honour of International Women’s Day, we caught up with 10 inspirational women who are working to make Hong Kong a better place to live. 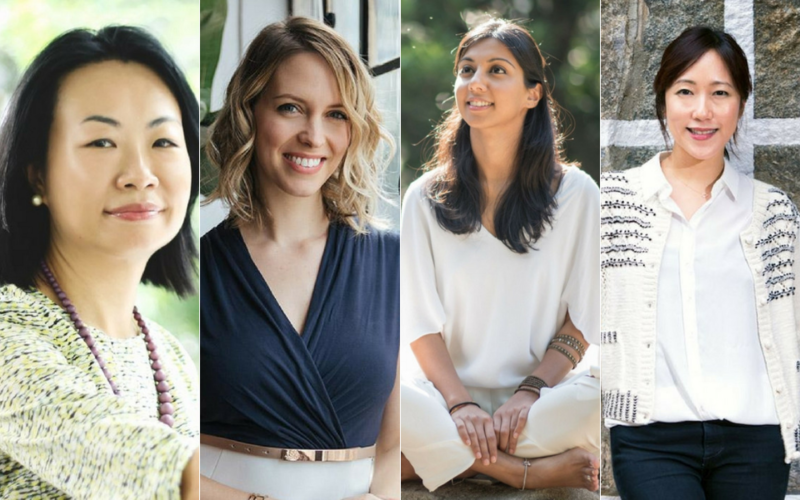 These visionaries have set out to change the city’s landscape in every aspect, from waste-saving innovations to inspiring podcasts, eco-friendly fashion, accessible yoga and much more. After reading zero-waste ambassador Bea Johnson’s book “Zero Waste Home” in 2015, Fanny Moritz looked for ways to clean up her own lifestyle, aiming to squeeze a year’s worth of waste into a tiny mason jar. “I had a revelation: it was high time to embrace a more responsible lifestyle by considerably reducing my waste!” says Moritz. But, in Hong Kong, Moritz found herself limited by a lack of convenient alternatives to plastic. The French entrepreneur took matters into her own hands and launched No!w No Waste e-commerce shop, where Moritz stocks stylish reusable, biodegradable, and compostable products, such as bamboo toothbrushes, solid deodorants, steel straws, and forever water bottles. Launched in 2017 as a retail arm of sustainable fashion NGO Redress, The R Collective (formerly BYT) turns the spotlight on emerging sustainable designers who are turning textile trash into high-end treasures. Overseen by fashion director—and Generation T lister—Denise Ho, The R Collective invites winners of the Redress Design Awards and Frontline Fashion, a fashion competition TV series, to design sustainable collections for consumers. For example, the debut Pop Collection, designed by Kate Morris, features upcycled sweaters and gorgeous cardigan-coats adorned with pop art-inspired patterns. In addition to The R Collective, Ho also runs Knotti—a sustainable knitwear collection that’s produced with the help of home knitters across Hong Kong, then polished by Knotti’s design team. Each locally made piece harnesses natural dyes and biodegradable yarn sourced from eco-friendly farms in Australia. Host and producer of #impactPodcast, Regina Larko has made it her mission to champion changemakers in Hong Kong and across Asia. Originally from Vienna, Austria, Larko moved to China in 2009 and worked in Shanghai and Beijing before relocating to Hong Kong in 2014 to work as an events progammer for The Economist. She launched #impact Podcast in 2017, with hopes of shedding light on inspiring and innovative entrepreneurs whose businesses are changing lives for the better. During the show’s first year, Larko has interviewed a slew of fascinating guests—think Christina Dean, of Redress; Sue Toomey of HandsOn Hong Kong; and Green Queen’s Sonalie Figueiras. Well before eco-friendly lifestyles gained momentum in Hong Kong, Sonalie Figueiras co-founded Green Queen wellness website with business partner Tracy Turo in 2011. A vast resource for health- and eco-minded Hongkongers, Green Queen evolved into one the city’s leading media platforms. The demand for healthy food also led her to found Ekowarehouse, a business-to-business platform that showcases certified organic food suppliers from all over the world. “My mission with both Green Queen and Ekowarehouse is to make it easy for consumers and businesses to live healthier lives,” adds Figueiras. Passionate about environmental issues and her hometown of Hong Kong, Ada Yip is the CEO of social startup Urban Spring HK. The eco concept launched in 2015 with a singular mission: To minimise single-use plastic waste in Hong Kong. The plan? To install trustworthy water stations across the city. But these aren’t your old-school fountains. Designed in Hong Kong, each tech-savvy Well# has been custom-built to accommodate forever water bottles, remotely monitor the well’s efficiency, and keep a digital tally of how many plastic bottles have been redirected from landfills. Keen to take your eco-friendly ethos all the way to the gym? Enter Rumi X. Founded by Melissa Chu in 2014, this eco-friendly activewear is crafted from upcycled plastic and coffee beans. While pursuing her own yoga certification, the California native encountered a dearth of ethical fashion options on the market. She started with vibrant yoga wear, then branched out into all types of sports gear, including running shorts, bras, and even maternity wear. Just last month, Tamsin Thornburrow opened Live Zero—Hong Kong’s first zero-waste grocery store in Sai Ying Pun. Also behind homeware store Thorn and Burrow, the forward-thinking entrepreneur wanted to find a solution to gratuitous packaging. The idea started as a pop-up at PMQ, and eventually evolved into a standalone neighbourhood store. Inside the rustic-chic shop, you’ll find all kinds of household and kitchen essentials in self-serve jars. There’s coffee, sugar, spices, quinoa, beans, flour—even hand soap, argan oil and shampoo. To further cut down on waste, shoppers are encouraged to bring their own containers, which eliminates the need for packaging. Devoted to making yoga more accessible in Hong Kong, 2015 Women of Hope honouree Hersha Chellaram runs Hersha Yoga. Not only does she provides private yoga therapy for children and adults with disabilities and chronic health conditions, but she also runs specialised teacher training certifications—all with an aim to share yoga with people who have different abilities. In addition, Chellaram has developed numerous therapeutic yoga programmes for schools and co-founded the YAMA Foundation, a nonprofit that brings free yoga, art and meditation programmes to underserved communities in Hong Kong. The generous spirit behind mindfulness platform Spiral Spaces, Resham Daswani is dedicated to spreading the practice of tea ceremony meditation in Hong Kong. Guided by a zen Buddhist monk at Global Tea Hut in Taiwan, Daswani discovered Cha Dao—“The Way of Tea”—and felt compelled to share this sense of renewed connection and awareness with stressed-out Hongkongers. Hong Kong has no shortage of diversity, but American Haley Meng felt the city could benefit from a platform that connects curious people from all walks of life. In 2015, Meng and friend Candy Tang founded WE Club in 2015: Short for West East Club, the platform curates cross-cultural experiences every week, such as meals, panel discussions, craft workshops, street art tours, yoga, or outdoor adventures. The aim? To connect like-minded people, learn something new, and have a great time in the process. Since launching in 2015, the group has organised more than 180 events for more than 6,000 participants.